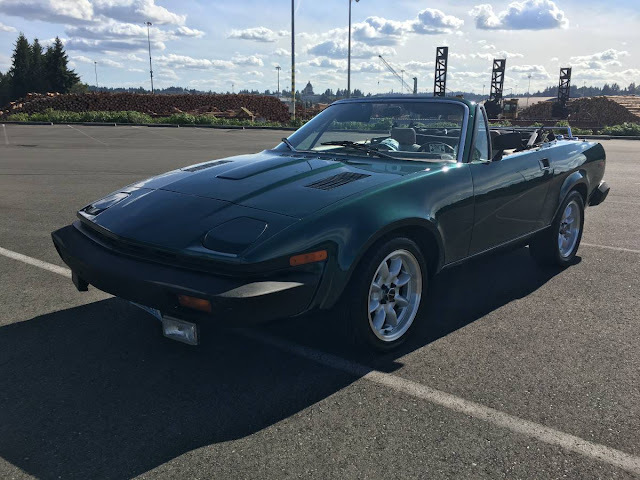 The seller describes this next car as "not your typical 80's crappy Triumph" -- hey, that isn't really fair...okay...maybe it is. The TR7 had some sweet wedge style, but power was low and handling wasn't exactly amazing, but some car builder decided to change that. 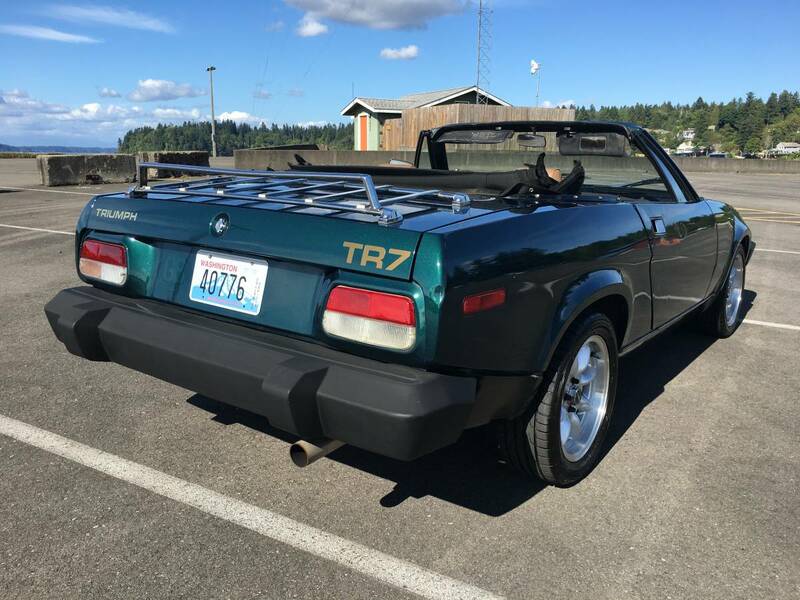 Find this 1980 Triumph TR7 offered for $5,500 in Olympia, WA via craigslist. Tip from Rock On! I've spent the last couple months cleaning this super fun car up. Freshly detailed, new tires and wheels, suspension, soft top and tune up. Very rev happy and fun to drive. Not your typical 80's crappy Triumph. 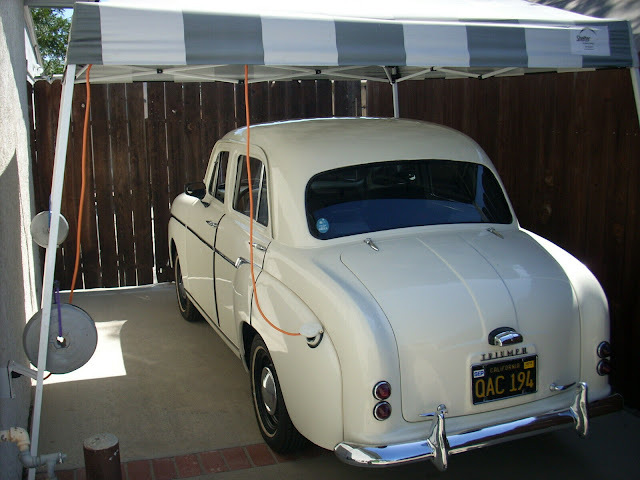 This car sits on custom ibach springs new shocks which helps this car handle really well. Sticky Toyo Tires that have a couple hundred miles on them. 15 inch panasport wheels that are super clean. Coilovers are adjustable and have lots of room to be lowered. New heavy sway bars stiffen up the cornering. The soft top is new and comes with a hard top as well. The paint is good with just a couple dings. The exterior has been freshly detailed. Engine revs to 10k RPMS easily and has been freshly tuned with plugs, wires, oil, fuel filter and is ready to drive. Open to interesting trades especially for an Audi wagon or euro vintage car. BMW 2002, mg mgb GT, triumph tr4, TR6, GT6, Datsun fairlady 2000, cars with minilites, perhaps a Miata with a hardtop, turbo charged 80's or 90's cars, manual transmissions and or AWD wagons. Swapped cars are fine as long as little rust is around. Porsche 914, 928, 912, 911 if it needs work. Willing to trade up or down also. Hey seller! Stop reaching into my mind and building the EXACT freakin' cars I dream about. Oh wait, never mind. Keep doin' your thing. Yeah, this car is awesome sauce. The color, engine, price it is all good. 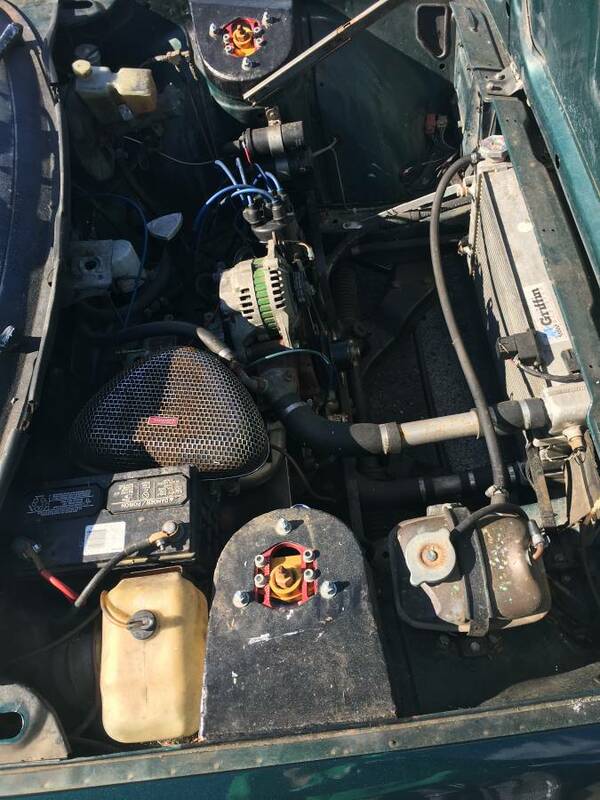 I always thought that the logical engine swap for a tr7 would be a SAAB engine perhaps a B212. The SAAB engine originating with a Triumph design and all. That Bangle-ish thing on the side is not as offensive to the eye now as it was then , but still Kudos to the seller for managing to make it invisible in the photos! My father in law offered me HIS Tr-7 for free, but it was so ugly, I turned him down. Even restored, it is not a pretty as the TR-4 or the TR-6.